Don’t forget to buy a ticket! For the first few years after I arrived in St. Gallen, ticket inspections on buses were a rarity. It happened less than once a year, but even then, only on the most popular bus routes. Someone at the bus company must have woken up though, as they now check frequently on most routes. I am getting checked once in every two or three journeys now. The penalty for no ticket is CHF 100, and if you have forgotten you ticket, it is CHF 5 plus the annoyance of lots of forms and a trip to the main station. Postbuses it seems are still exempt though. I have still never been checked on a postbus! I normally don’t comment on politics since it isn’t relevant to practical advice on living in St.Gallen, but this is an interesting topic and does have direct relevance to many people in the city or considering moving here. I was really surprised when the Swiss voted to bring back immigration quotas for European citizens and also, as a consequence, most likely withdraw from the Schengen agreement that allows visa-free travel around Europe. It was already hard for non-EU citizens to get jobs and permits here, but now it is going to be hard for Europeans as well. 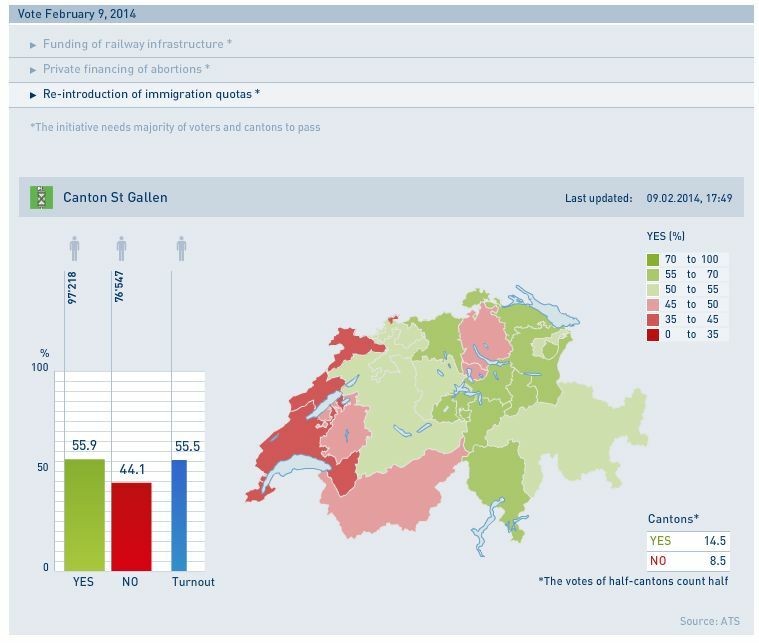 What was interesting was that St.Gallen was one of the cantons that voted most strongly in favour of limiting migration (see graphic below). I was really surprised about this as the canton and city derive lots of benefits from the many international companies in the Rhein valley and from a well known international university that relies partly on income from international students. In particular, I know lots of people who came to Switzerland to study, in spite of the high costs, partly with the aim of securing employment here after graduation. This was already tough, but now it is going to be very unlikely for many foreign graduates, especially those from outside of the EU. Thanks for all the e-mails! 2) The Swiss are different from the Germans and Austrians. And that is the only thing they want to hear you say. Never group the three into a single statement! 3) Don’t be fooled into thinking that just because Switzerland is a rich country, that all accommodation is 1st world standard. Take no basic service for granted! 4) Swiss don’t seem to cook at home. So prepare for a small, inconvenient kitchen even in the largest of flats. 5) “Switzerland has high quality education” does not equal “all Swiss schools are good”. 6) Most Swiss people use public transport, not because it is so good (which it is), but because owning a car is so bloody expensive and inconvenient! 7) Figure out how to shop over the border in Austria. For everything. Its all a lot cheaper. 8) Don’t expect to ever be invited round to a Swiss person’s house. Be happy when it happens, but prepare for it never happening. 9) Working from 9-6 is unSwiss. 8am is already late in the office. Questions about Living in St.Gallen?